As we look forward to 2018, I am happy to report that we ended 2017 on a high note as our patrons and supporters filled The Lady Chapel at St. Patrick’s Cathedral for our St. Lucy Mass on December 13. We were delighted to have our clients participate in the Mass, led by Father Jamie Dennis. A braille reader and a client since 2008, Father Jamie was ordained in 2016. He continues to receive our Monthly Sunday Mass Propers in braille which he uses to celebrate Mass at his parish in Owensboro, Kentucky. In addition, we were very fortunate to have several of our patrons lead the readings, Responsorial Psalm, and Prayers of the Faithful, all using our Mass Propers in braille. Providing the Mass Propers in braille, which include each Sunday’s Mass readings, prayers, and responses, is at the heart of our mission, assisting so many of our patrons to actively practice their faith. Each and every month we send the Mass Propers to over 800 patrons. Annually this amounts to nearly 10,000 volumes and over 750,000 pages of braille! All of this important work can be sustained only because of the generosity and prayers of our many benefactors. If you haven’t given before, or if you haven’t given in a while, I hope you will consider making a donation. 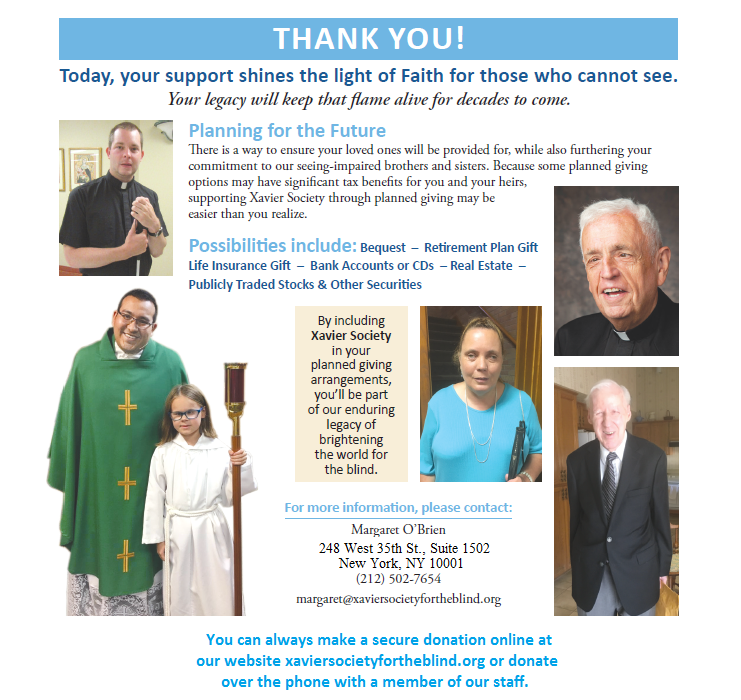 This will support our production of The Sunday Mass Propers in braille and all of our work which impacts so many of our patrons personally each and every day. I thank you and I wish you all the best in the New Year. A new year has brought with it a new home for Xavier Society for the Blind. At the start of January we packed up our offices and made the long journey north to our new home - an arduous three blocks! Although we are relatively in the same neighborhood as we were, we will miss all of the friends we made over the last four years or so. Thank you to everyone at American Foundation for the Blind who helped us over the years and made our transition so smooth, especially Kelly Bleach and Cynthia Simmons. For those of you who missed our post on our Facebook page and Twitter feed, St. Lucy is enjoying the view from her home on the 15th floor. She gets a bird's eye view of Madison Square Garden and the Farley Post Office where everyday we ship out lots of braille and audio materials to our patrons across the globe! 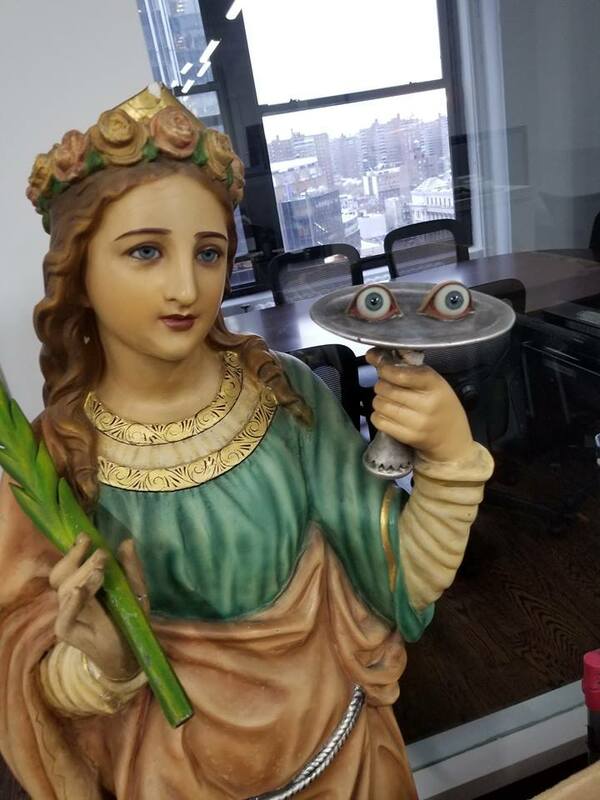 Caption: St. Lucy enjoying the new digs! In case you missed it, here is the great piece that aired on NET-TV a little while back. Reporter Katie Engesser from De Sales Media stopped by to check out our offices and learn more about our organization and our mission to provide the Word of God to the blind and visually impaired community of Faithful. Thanks so much to Katie and the Currents crew for helping us sustain that mission! We would like to remind our patrons that in conjunction with Fordham University, the Jesuit University of New York, our audiobook library has various contemporary lectures for our patrons in our circulating library and on our website to download. Many thanks to Fordham University's Center for Religion and Culture (C.R.C.) for its cooperation! To stream these lectures with video please follow this link. If you would like to request any of these, please get in contact with us! A ll of us at Xavier Society for the Blind would like to extend our congratulations to the American Printing House for the Blind on its 160th anniversary. Based in Louisville, KY, A.P.H. mission is to promote the independence of people who are blind and visually impaired by providing specialized materials, products, and services needed for education and life. Check out their website by clicking here . Also, we'd like to send our best wishes and congratulations to our fellow New Yorkers, Helen Keller Services for the Blind on their milestone 125th anniversary. Based in Brooklyn, H.K.S.B. enables individuals who are blind, visually impaired, deaf-blind or have combined hearing and vision loss to live, work and thrive in the communities of their choice. Learn more about this organization by clicking here. Thank you to both A.P.H. and H.K.S.B. for their outstanding services and the support they have provided to blind and visually impaired people for well over a century. 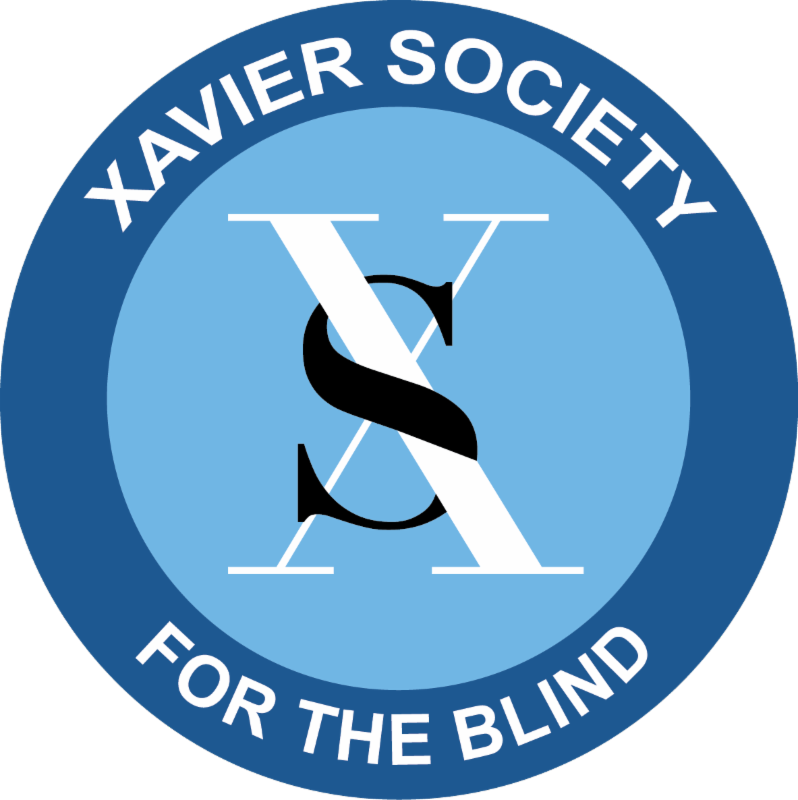 At 118 years old, Xavier Society for the Blind is not far behind you! Keep up the great work. 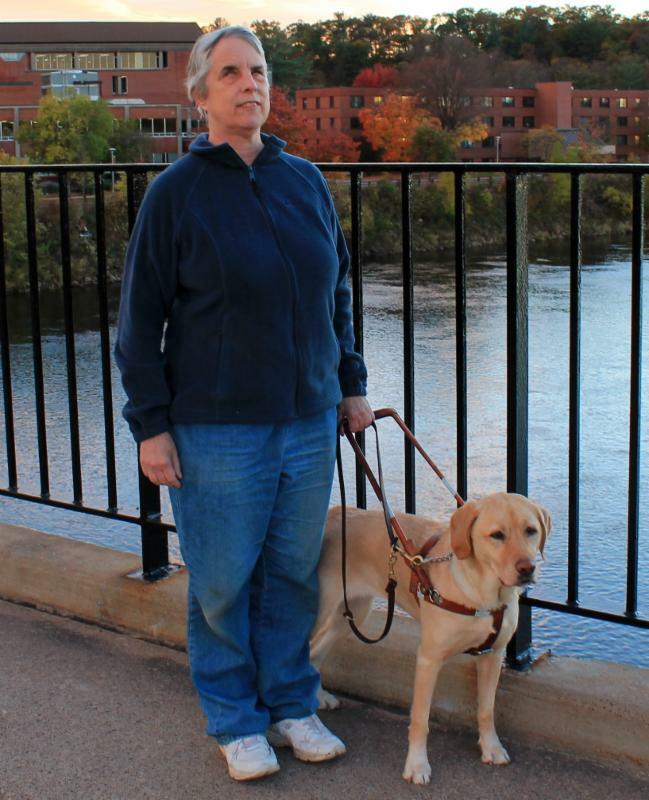 Katherine Schneider, Ph.D. is a retired clinical psychologist living in Eau Claire, Wisconsin with her ninth Seeing Eye dog. She’s been a Xavier Society patron for over thirty years. Kathie joined the Catholic Church in 1986, partly because of Xavier Society for the Blind. Kathie receives the Propers of the Sunday Mass in braille which she uses to lector, and other spiritual readings so she can grow in her Faith. Currently she is serving on her parish council and has had the joy of being a confirmation sponsor. Katherine has published a memoir To the Left of Inspiration: Adventures in Living with Disabilities, a children’s book Your Treasure Hunt: Disabilities and Finding Your Gold and a book for seniors, half of whom will develop disabilities, Occupying Aging: Delights, Disabilities and Daily Life. All are available from the National Library Service and from Bookshare. She originated the Schneider Family Book Awards for children’s books with disability content through the American Library Association and an award for superior journalism about disability issues through the Walter Cronkite School of Journalism at Arizona State University. I am 86 years old and in April I will be married to my bride, Dorothy 65 years. We have 9 children, 20 grandchildren and 5 great grandchildren. We are both Lectors and Extraordinary Ministers of Holy Communion, have served on Pastoral Council and in 2015 were in the first group of people inducted into St. Catherine of Siena’s parish Hall of Fame. I worked at the R & D Laboratories of Atlantic Refining Company for 10 years and GE Aerospace Labs for 30 years. As you probably can tell, I just can’t stick to anything too long. In 1979, I stopped smoking and found I had time on my hands. As a result, I began to look for volunteer activities. Dorothy and I were in a fabric store and heard a PSI for Volunteer Services for the Blind. VSB became Associated Services for the Blind (VSB) several years later. I had often been told that I had a nice voice, so I volunteered to be a narrator for the blind. I have read many books, AA help books and Evidence of Coverage books for Health Organizations. I was a regular on their Radio station RICB for several years until they closed it. Since then I have been recording a once a week “Business News’ program which appears on ASB’s web site. In August 2012, my nephew's mother-in-law, Mrs. Eileen Fanning Aukward, died. She had 2 sons who were blind and she asked for donations to Xavier Society for the Blind. I contributed and shortly received some literature which described your services. I called Fr. John Sheehan and he signed me up to be a narrator. Donald Salvato has put me to work on several projects. Among them were: 33 Days to Morning Glory, The Light is on for You and Our Sunday Visitor. I have been the voice of Our Sunday Visitor for several years and hope to continue for another 14 years. 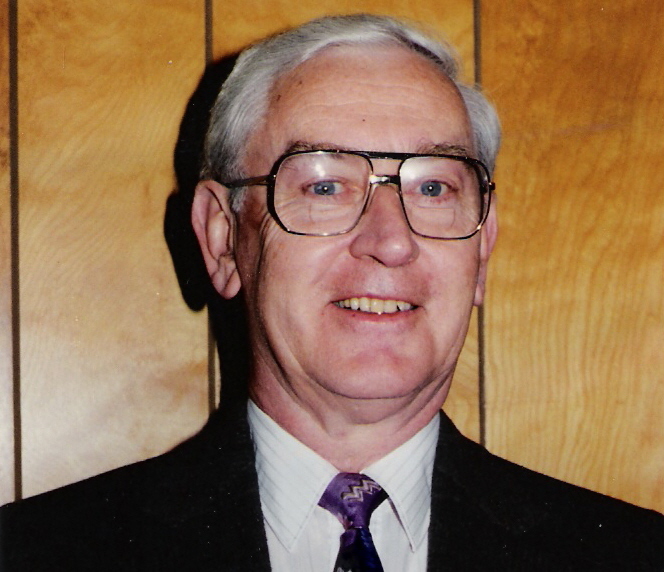 Thank you to Bill for his years of extraordinary service, and to all of our volunteers who help further our mission! 3. Reflections on Growing Old (D0367) by Rev. John LaFarge, S.J. 5. Edith Stein: A Biography (D0609) by Waltraud Herbstrith, O.C.D. 8. The Spirituality of St. Francis of Assisi (D1165) by Brother William Short, O.F.M. 9. The Crusades (D1180) by Professor Christopher Bellitto, Ph.D.
- My Little Book of Prayers by Brown Watson Publishers (B1600, 1 volume): Traditional prayers suitable for children. - Sidewalks, Sacristies, and Sinners: Stories of Living Faith (B1601, 1 volume): Gospel like stories and parables. - The Iguana Tree by Michael Stone (B1602, 3 volumes, fiction): Set amid the perils of illegal border crossings, The Iguana Tree is the suspenseful saga of Lilia and Héctor, who separately make their way from Mexico into the United States, seeking work in the Carolinas and a home for their infant daughter. - Border Child: A Novel by Michael Stone (B1603, 3 volumes, fiction): Young lovers Héctor and Lilia dreamed of a brighter future for their family in the United States. Héctor left Mexico first, to secure work and housing, but when Lilia, desperate to be with Héctor, impetuously crossed the border with their infant daughter, Alejandra, mother and child were separated. Alejandra disappeared. Now, four years later, the family has a chance to reunite, but the trauma of the past may well be permanent. - The Catholic Church: A Short History by Hans Kung (D1204): Kung chronicles the Roman Catholic Church's role as a world power throughout history. Along the way, he examines the great schisms between East and West, and Catholic and Protestant as well as the evolving role of the papacy, the stories of the great reforming popes, and the expansion of a global church infrastructure. - Angels of God, Our Guardians Dear: Today's Catholics Rediscover Angels by Mary Drhaos (D1205): Captivating stories of angels at work in the lives of the saints. Inspiring accounts of angels intervening in the lives of people today. - Champions of the Rosary by Donald Calloway (D1206): The author deftly negotiates the complexities of the story of the rosary, weaving the historical, theological, and devotional strands into a veritable masterpiece of scholarship and piety. - Why the Rosary, Why Now? by Gretchen Crowe (D1207): The author makes a compelling case for why praying the Rosary is more critical in today's 21st-century world than ever before. Next month heralds the Memorials of Saint Agatha, Feast of the Chair of Saint Peter, Memorial of Our Lady of Lourdes, and the beginning of the Lenten season. Here are some books for these and other special occasions! - Christian Prayer: Ash Wednesday and the Sundays of Lent (B6004, 2 volumes): Liturgy of the hours for Ash Wednesday and the Sundays of Lent. - A Woman Clothed With the Sun by John J. Delaney (B1189, 3 volumes): Considers the eight most significant apparitions of Our Lady in the past two centuries: that of the Miraculous Medal at Paris, those at La Salette, Lourdes, Knock, Fatima, Beauraing, Banneux--and also the sixteenth-century appearance of Mary at Guadalupe with its profound message for Americans. - Super Saints You Should Know by Bob and Penny Lord (D1089): Great saints that you probably have never heard of, but you should know. Includes St. Agatha of Catania, St. Mary Magdalena de Pazzi, B. Brother Andre, and many others. - St. Peter: The Frail and Solid Rock by Archbishop Fulton Sheen (D1087): Humanly speaking, Saint Peter was the furthest thing from a rock; he was weak and vacillating. Yet Our Lord established him as the foundation of His Holy Church.